This brief outline history is an attempt to place on record the work carried out by colleagues at the UK National Coal Board (NCB; became British Coal Corporation in 1987) Coal Research Establishment (CRE). The NCB's 'coat of arms', which was also used by CRE, is shown left, with its Latin text "E TENEBRIS LUX", meaning "Light out of Darkness" or "From Darkness, Light", presumably referring to the blackness of coal which produces light when it burns. This history draws upon my own memories and understandings, plus information obtained from Wikipedia entries, from the National Archives at Kew and from ex-colleagues Martyn Davis, Peter Sage, Carol Minter and Martin Mordecai. Carol made available copies of CRE Annual Reports and other documents covering the earliest time of CRE's existence, from mid-1948 to 1955. Martyn Davis, who had responsibility for site maintenance prior to its 2015 demolition, preserved various photographs, documents and other items. All of these have been used in providing authoritative substance to the Section below headed 'CRE Formation'. The items from Carol and Martyn were deposited on 10th August 2017 at Gloucester Archives, off Alvin Street, Gloucester, with a Reference D14505 Acc.14505 (contact Paul Evans, Jenny Rutland and Karen Davidson). The author's personal knowledge of CRE does not begin until autumn 1978, so I continue to welcome comment from colleagues who worked there during my own, and earlier, times. Ex-colleagues who have contributed since this web page was first uploaded are Nigel Paterson, Mike Vickers, John Eckersley and John Topper. I had much respect for many of the colleagues who I worked with during my time at CRE (September 1978 to April 1997) and endorse a belief that CRE representated a globally recognised source of high-quality coal science. Visitors regularly came to CRE from all around the world to witness and discuss our work (as can be seen in photographs below), while CRE representatives made similar overseas visits to mutual benefit. Alongside is a picture of the flag which was flown on special occasions from the flag pole in front of the new office building (right foreground, below). The white flag pole can be seen (though seemingly without the flag flying) near the centre of the picture below. The flag measured some 6 feet x 3 feet (1.8m x 0.9 m). all of them being Fluidised Bed Combustion (FBC) equipment manufacturers. 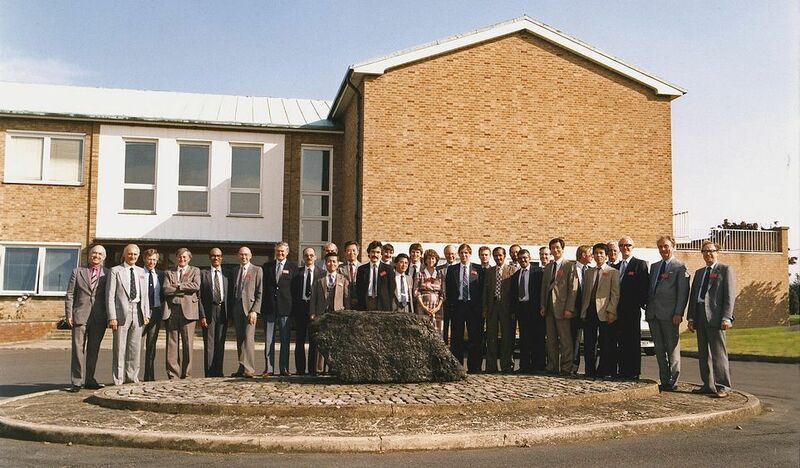 A party of Chinese Ministry Engineers visit CRE, funded by The World Bank, in March 1993. 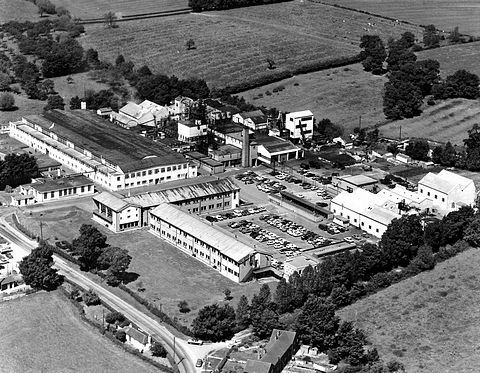 For 50 years, until the end of 1997, CRE was based at Stoke Orchard, a village to the north-west of Cheltenham in Gloucestershire, England. Stoke Orchard is in the borough of Tewkesbury and neighbours Elmstone-Hardwicke, Tredington and Bishop's Cleeve. Colleagues always referred to Stoke Orchard as being near Bishop's Cleeve. Telephone: 0242 67 3361 (The Cheltenham telephone code has since changed to 01242). The National Archives, at Kew, have a website which describes how, after the National Coal Board was formed, on 1st January 1947, the functions and records of the Powell Duffryn Research Laboratory (previously within the South Wales mining company called Powell Duffryn Associated Collieries, but within the NCB from 1947) became the basis of the Research Establishment which eventually became known as the Coal Research Establishment (CRE). The Kew Archives contain CRE Annual Reports going back to 1st January 1949, though that first Report also includes comment from the earliest time of CRE's existence, 1st April 1948. Six such Reports cover dates to 31st December 1954 that are entitled "National Coal Board, Scientific Department, Central Research Establishment Annual Report". The 7th report, covering 1st January to 31st December 1955, is entitled "National Coal Board, Scientific Department, Coal Research Establishment Annual Report", confirming that CRE, as the Coal Research Establishment, came into existence during 1955. The National Coal Board (NCB) was the statutory corporation created to run the nationalised coal mining industry in the United Kingdom. It was set up by Clement Attlee's post-war Labour government under the Coal Industry Nationalisation Act 1946, and it took over the mines on "vesting day", being 1st January 1947. 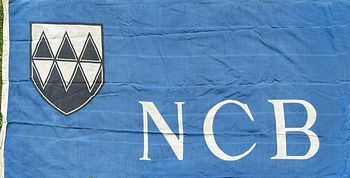 In 1987 the NCB was renamed the British Coal Corporation (BCC), and its assets were subsequently (by 1994) privatised. Lord Hyndley, Chairman of the National Coal Board, inspected the Board's newly opened Central Research Establishment at Stoke Orchard, Cheltenham, on 24th April 1950 (ref: newspaper archives; Dundee Evening Telegraph). Wikipedia tells us that the Stoke Orchard site was previously a Ministry for Aircraft Production shadow factory run by the Gloster Aircraft Company adjacent to RAF Stoke Orchard. A shadow factory was a factory set up to emulate the manufacturing capabilities of a parent organisation, such that production could continue in the event of the parent company suffering war damage. Martyn Davis, an ex-CRE colleague, tells me that his father-in-law was born and lived in Stoke Orchard village and had told him that "the Gloster Aircraft Company occupied it during the war (WW2) and they made engines there. They were tested in the site's out-buildings before being taken to the adjacent RAF Stoke Orchard, where completed aircraft took off from the airfield across the road, by the refuse tip" (now run by Grundon Waste Management at Wingmoor Farm, Stoke Orchard Road, Bishops Cleeve, GL52 7DG). The Stoke Orchard and Tredington Parish Plan, October 2009, reveals that RAF Stoke Orchard became a base preparing for D-Day (6th June 1944) at which pilots were trained to tow the transport gliders which would carry the troops and equipment over the channel for the Normandy landings. After the D-Day landings the RAF left and WarAg (the War Agricultural Committee) took over the hangars as an implement depot and repair centre for their agricultural equipment, used for improving unproductive land. Martyn understands that the CRE site was acquired by the NCB from Roy Fedden (since confirmed; Ref: Introduction to the 1949 CRE Annual Report) who had the site after the Gloster Aircraft Company and where he made a prototype automobile, but it did not get into production. It was powered by a three-cylinder air-cooled radial engine that had vibration and overheating problems. Also the car tended to skid badly when being cornered hard. Work started on a replacement chassis, but the rest of the company's engineers lost interest and left, and soon the company had to be dissolved. After this, Fedden worked for a time consulting with George Dowty, but soon retired and spent his time teaching at the College of Aeronautics at Cranfield University. The site was acquired from Roy Fedden by the National Coal Board's Scientific Department (Headquarters) on 1st April 1948. Thence, preparatory work was carried out in equipping and modifying the site's buildings to house a small research staff from South Wales and London. This staff were transferred to CRE on 1st September 1948. On that date the Central Research Establishment was placed under the local control of a Deputy Director of Research, Dr.D.C.Rhys Jones. By the end of 1949 CRE was staffed by 25 Graduates, 50 Technologists and 64 Administrative & Industrial staff, with an overall authorised annual budget of near £80,000. The land comprised 10 acres (maybe more precisely 9.913 acres) with a main building (that became known as the Hanger Building) containing offices and laboratories, plus (separately) workshops, a canteen (which continued to be used for this purpose until site closure, 50 years later), various small outbuildings and two partially completed structures (these are probably the buildings which, after completion, became the garage and PB16). By December 1949, some long serving employees were already in post, including Jack Owen (who became Deputy Director by the 1970s). CRE Stoke Orchard, apart from its proximity to the Forest of Dean coalfield which was not part of the NCB, and the South Wales No 6 (Monmouthshire) Area of the SW Division, was otherwise remote from any direct coalfield connections or allegiance. The oft recounted (unconfirmed) anecdote about the reason for the location of CRE near the spa town of Cheltenham, appears in Steve Wright's book "Fluidised-Bed Combustion, A Clean Coal Combustion Process that Nearly Was". He wrote "When, in the 1950s, much against its anti-intellectual instincts, the NCB was forced by Her Majesty's Government to indulge in some research, they needed somewhere to build their CRE. The man in charge of the project was Welsh, ... and found his ideal site at Stoke Orchard near Cheltenham. It was part of a vast World War II RAF Maintenance Base, and some of the hangers were still extant at the end of the 20th century. The NCB bought a hanger and some adjacent land and built CRE. The official excuse was that the site was sufficiently far from any coalfield so as not to be influenced by parochial interests. In fact it was closer to South Wales than any other coalfield, provided that one ignored the dying coal areas of Somerset and Forest of Dean. It was also somewhat closer to Cardiff than it was to Hobart House (NCB HQ in London). The man in charge perceived an overwhelming advantage for Stoke Orchard; he could call a meeting at CRE on a Friday afternoon and comfortably travel on to enjoy the rugby at Cardiff Arms Park the next day". This illustration of the Hanger Building was used in the first Annual Report, dated 1949. The sloping roof 2-storey frontage may have been a modification by Roy Fedden. The building was subsequently widened along its entire length, at first floor level, by January 1954, providing much needed extra office and laboratory accomodation. Compare this view with the one lower down. The Central Research Establishment was set up by Dr.W.Idris Jones, formerly (from 1933) the Research Manager for Powell Duffryn Ltd. Idris Jones was appointed Director General of the Scientific Department of the newly formed National Coal Board (from 1st Jan 1947) under Sir Charles Ellis, F.R.S. (NCB Director for Research and Development). The Gloucestershire Echo, in its issue for Wednesday 15th September 1948, reported that "Research teams from South Wales and London have moved into the Stoke Orchard factory (the term 'factory' being to do with the previous Roy Fedden manufacturing activities) which has been taken over by the National Coal Board as the Central Research Establishment". Although the site was initially placed under the control of Dr.D.C.Rhys Jones, as the Deputy Director, it seems the post of Director was always intended to be held by Dr Jacob Bronowski, but he could not take up that post until spring of 1950. Another Gloucestershire Echo archive, 14th April 1950, reports him as being newly appointed. Wikipedia sums up Jacob Bronowski with the words ".......(18th January 1908  22nd August 1974); a Polish-Jewish British mathematician, biologist, historian of science, theatre author, poet and inventor. He is best remembered as the presenter and writer of the 1973 BBC television documentary series, The Ascent of Man, and its accompanying book". Anecdotally, he was best remembered by CRE staff for his development of Bronowski's briquettes, a form of smokeless fuel made from coal dust, but its uncertain whether they were mass produced. Anecdotally, these briquettes were also referred to as 'Bronowskis's bullets'. They may have been the forerunner of the 'Homefire' smokeless fuel briquettes which were definitely manufactured commercially, firstly at Birch Coppice pilot plant and later at Coventry, at the 'Coventry Homefire' plant. In a Financial Times article by Erica Wagner, dated 21st November 2014, I quote: "Theres a photo from Bronowskis NCB days of him standing with Prince Philip, about to inspect some of his famous briquettes. Apparently when they actually looked at them, Prince Philip said, They look just like turds!'. The Illustrated London News archive suggests this meeting may have taken place in March 1957. The earliest Annual Report, covering the period from inception, 1st April 1948, until the end of 1949, was submitted to the Director General by Dr Rhys Jones. The work of the Central Research Establishment was essentially to do with mining (especially health and safety issues), coal preparation (washery techniques), coke manufacture by carbonisation, coal combustion and refining industry byproducts, especially tar processing. The 1950 Annual Report to the Director General, from Dr Bronowski, details the work carried out under the categories Mining, Carbonisation, Coal Preparation and Chemistry, the latter including the study of coal tars and the inorganic constituents of coal. There was even an experimental coal face being installed at CRE, presumably to further support the technology of coal mining. By 31st December 1950, staff strength totalled 239, "still 24 short of compliment". A Photographic section had been formed and also a Mathematics section, both directly responsible to the Directorate. The 1951 Annual Report showed a similar pattern of work to that of the previous year, though the number of research topics had grown significantly, as noted somewhat anxiously by Dr Bronowski in his Introduction. During 1952 an interesting change took place at CRE. The mining research topics were split away from the rest of the establishment's activities into a structure known as CRE II, which was transferred to a new establishment. This took place during the summer months. Thence, from 1st September 1952, the remnant CRE (CRE I) was made up of 6 sections, including two new ones, these latter dealing with: (i) the application of fluidised bed processes to coal carbonisation and (ii) briquetting. The other four were as previous, being (iii) coal preparation, (iv) carbonisation, (v) chemistry and (vi) a residual physics department not transferred into CRE II. Fluidised bed technology was being assessed for oxidising Betteshanger (Kent) coal as an aid to Phurnacite (smokeless fuel) production via the erection of a 1tph FB pilot plant, aimed to commence operation in January 1953. Dr Bronowski's introduction to the 1953 Annual Report explains the purpose of the reorganisation of CRE that took place in 1952. "...we wholly changed the accent of our work, which has since been grouped round a single problem.....to make highly efficient smokeless fuels, chiefly for the home, from the low rank, high volatile coals.....which will form an increasing proportion of the coal mined in Britain". This work was sub-divided into (i) coal cleaning (especially dust and slurries), followed by (ii) pre-treatment to make non-coking coals amenable to carbonisation, then (iii) briquetting, and finally (iv) carbonisation of the briquettes to make a smokeless fuel. Product briquettes were required "....with a high content of accessible heat....on a reasonably up-to-date open fire, on which (otherwise)..... the fraction of heat available even from good large coal is small". There are references thereafter in the 1954 Annual Report to the work of CRE I, being those involved in smokeless briquettes R&D, as distinct from the Mining R&D carried out by CRE II. A Summary Report of the work at CRE from 1952 to 1955 explains this new direction thus "The Beaver Committee Report and the Clean Air Bill (which became an Act in 1956) have increased the urgency of producing smokeless fuels and so the programme for 1956 is essentially concerned with problems with their manufacture". The research direction of CRE had moved away from supporting the whole of the mining industry (this had become the province of CRE II) and towards supporting the utilisation aspect of coal once it is mined (CRE I). This separation continued until CRE was responsible solely for coal utilisation R&D. Mining Research was then carried out at a 'sister' NCB research establishment entitled MRDE (Mining Research and Development Establishment), located at Bretby, near Burton-on-Trent, Derbyshire. MRDE was responsible for research into, and the testing of, mining equipment and mining procedures, and was appropriately located near to the Midlands, Nottingham, Lancashire and Yorkshire coal fields. The author understands that MRDE was an amalgamation of the original Mining Research Establishment at Isleworth from 1952 (perhaps this refers to CRE II? ), and the Central Engineering Establishment at Bretby. These merged in 1969. A 1954 report on Heat Transfer in Fluidised Beds (CRE I Report No.1241, by B.A.Lilley) seems almost phrophetic in the context of the vast amount of R&D into fluidised bed application that took place from the late 1960s at CRE (from 1963 at BCURA, Leatherhead). The difference was that, in the mid-1950s the fluidised bed was being applied to the carbonisation of coals and modification of their coking properties, whereas 20 years later it was applied extensively to coal combustion. The 1954 report's summary reads: "The discrepancy between results obtained by two methods of estimating the efficiency of heat transfer from the fluidising gas to fine coal has been resolved in favour of the high efficiency result. It is concluded that heat transfer is effectively complete within a distance of less than a centimetre from the point of entry of the hot gas, and that the efficiency is therefore practically insensitive to the formation of bubbles within the bed". By the end of 1952 the staff compliment had risen to 304 (out of a required compliment of 349), leading to "serious overcrowding unless the building programme is speeded up". 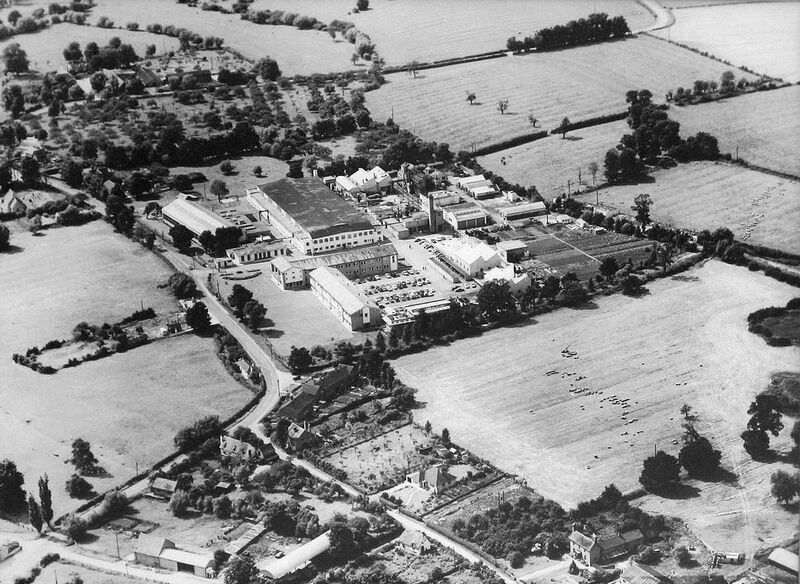 This concern was answered by 'new first floor laboratories and offices', believed to refer to around 20 new first floor rooms being added along (at least) the southern length of the original Hanger Building (south is towards the top in the above picture), plus a new garage building, both becoming available by January 1954 (in the mid-1953 picture above, the garage to be, centre foreground, is still under construction). A new Boiler House and Engineering Workshops were also pending (the former to be situated between the garage and the Hanger Building, the latter behind the gate house on the south side of the Hanger Building). 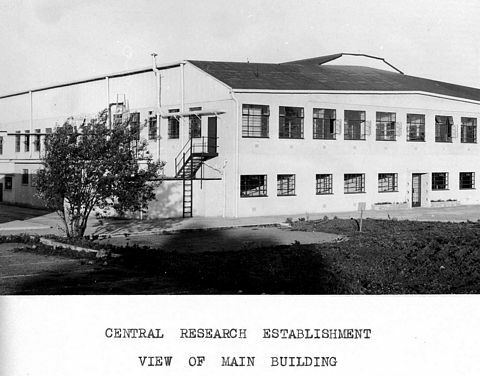 Although ambiguous, the 1954 Annual Report suggests that construction of what became known as the 'new' office and laboratory building, located on the opposite side of the entrance roadway from the Hanger Building, commenced on 1st June 1954. By the end of that year "the roof, the greater part of the walls and many of the internal serivces were in position". In the picture above, the land where this new office building was eventually located, is still undisturbed. Below is another early photograph of CRE Stoke Orchard, believed to have been taken in Spring 1954, since construction of the new office building has still not commenced. This view, and several others, have been made available by an ex-CRE colleague, Dr. Nigel Paterson (who worked in Analysis and Testing Branch). Nigel says "When (the site) was closing (end of 1997), I rescued some glass plate negatives from the photographic store, which show CRE developing from the late 1940's to the mid 1960s (approx.). I put these into the Records Office in Alvin St, Gloucester. I included them in the archive of the Gloucestershire Buildings Recording Group as project number 156. I was Chair of the GBRG and wanted to make sure they were safe and remained in Gloucestershire. I did print some of them directly as the negatives are large and excellent quality". The view below looks across an open field towards the Main Hanger building. By the time of this photograph, the Hanger Building has received its new extension of a continuous row of offices at first floor level. Also, the part completed building (at the time of the site's purchase) that was to become CRE's garage building (see the extreme right hand building with the three roller shutter doors) has been completed, together with the adjoining building behind it, which was to become Process Building (PB) No.16. The site's coal fired heating boiler house, and shower block, subsequently to the left of the garage, are still absent. Comparing it to the aerial view at the top of this page, the 'gardener' in the centre foreground must be standing on what became the mown lawn at the right hand (front; southern) end of the aerial view, in front of the long office building that faced the Stoke Road. Behind the gardener is uncultivated land which has been fenced off, possibly indicating the pending start of construction of the new office building. 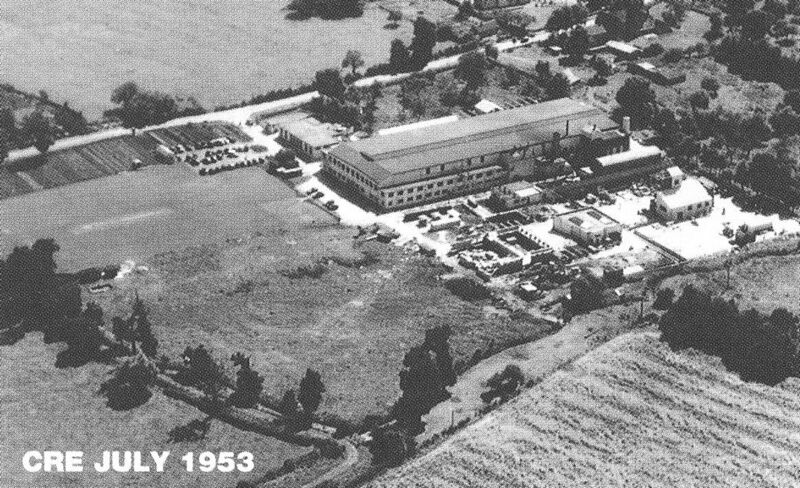 Alongside is an August 1955 perspective view of the proposed new Engineering Workshop. The workshop is in the foreground, with the Main Hanger building behind it. The new office and laboratory building, which is believed to have commenced construction on 1st June 1954, is also shown in the right hand background as a 'L' shape (though may not have been completed at the time of this drawing). The new office building did not receive the additional 'L' shape block that completed its overall square formation (see the aerial view at the top of this page) until the mid-1970s. The small building to the right hand end of the Engineering Workshop is the canteen building, which was part of the site's building compliment when purchased in April 1948. The Engineering Workshop also incorporated the site Drawing Office, Carpentry services, Electricians and Instrumentation. The new site Boiler House, and adjacent ablutions block (including showers), were completed by January 1955. 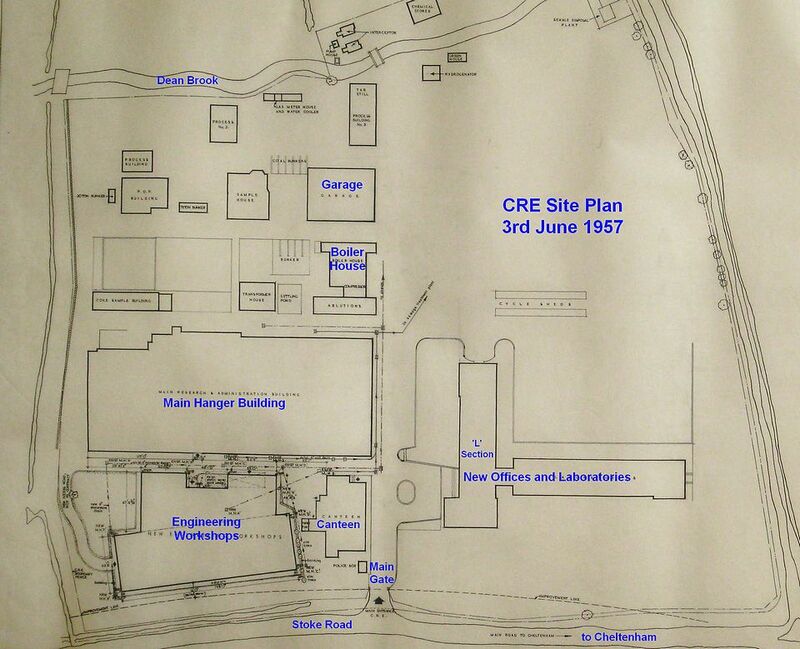 A CRE site plan for 3rd June 1957 is shown below, and includes the Engineering Workshops and Boiler House. The new 'L' section offices and laboratories building, construction of which started in June 1954, is believed to have been essentially completed by the end of 1955, though it may not have been internally furnished, equipped and occupied until the end of 1956. This building is shown on the June 1957 site plan, above. Further photographs of the construction of this building can be seen here. During the early 1960s, the Domestic Heating 'Fuel' Laboratory was added to the far end of the 'leg' of the 'L' that is parallel to the Stoke Road. Further photographs of the construction of this building can be seen here. 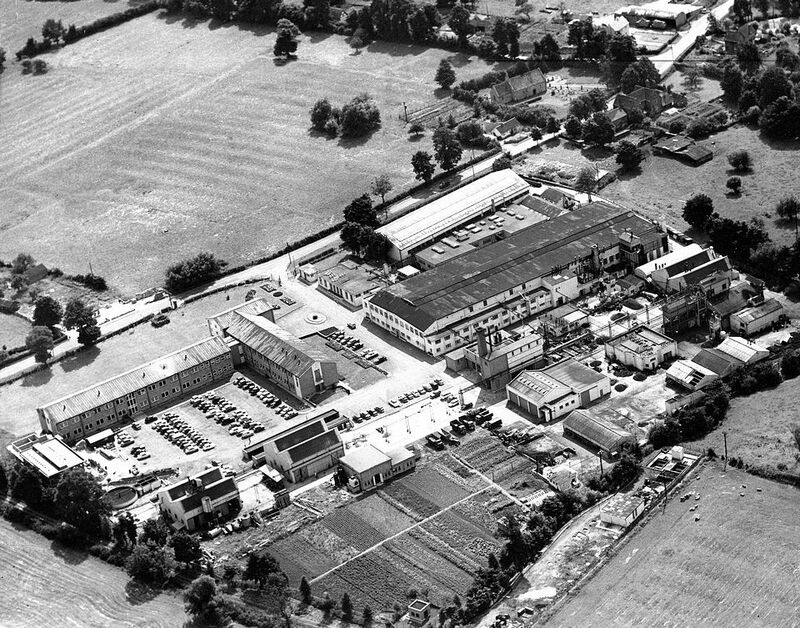 Further below is a black & white site aerial view that is believed to date to the early 1960s, probably taken not long after the Domestic Heating Appliance 'Fuel' Laboratory was completed. At this time, the northern site boundary (the right hand lower corner of the picture below) extends to the Dean Brook (see the line of trees), while the western boundary (to the right) extends to just beyond the end of the Hanger Building. The site was subsequently extended in both of these directions, as can be seen in the aerial view at the top of this page. The western extension became the site car park when the car park behind the new office building could no longer be used as such due to further offices being built on that land as related below (mid-1970s). Notice the large piece of South Wales (near anthracite; 200 Rank) coal, that became a long term feature of the entrance to CRE, on its 'roundabout' plinth in the centre of the driveway leading to the new office building foyer. That 'roundabout' is shown on the site plan drawing above, dating to June 1957, and its entirely possible the coal 'lump' was already in place by that time. Ceri Thompson (Curator at The Big Pit:National Coal Museum, Blaenafon, Torfaen, NP4 9XP) tells me (July 2017) that it originally came from 'the 9 foot seam' at Deep Navigation Colliery, near the village of Treharris in the borough of Merthyr Tydfil. A large group of visitors and staff are standing in a semi-circle behind this coal, on its 'roundabout', in the 2nd picture down from the top of this page. 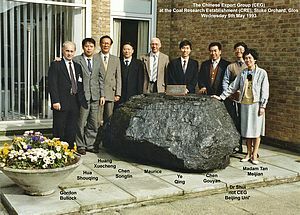 At the time of its acquisition, the 'Deep Navigation' coal 'lump' was believed to be the single largest piece ever mined. 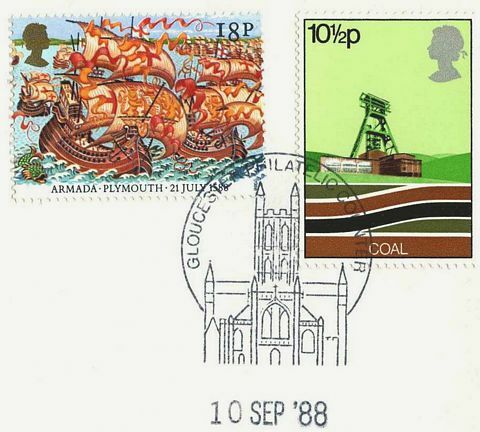 But in 1989 a second, even larger, coal 'lump' became available. With the approach of CRE privatisation, the mini 'roundabout' had become something of an obstruction and was removed and the first coal 'lump' (weighing about 1tonne and 2m long, 1.8m wide, 0.9m high) was stored on site in PB5 until Martyn Davis arranged for it to be sent for display at the National Museums & Galleries of Wales in July 2003. Ceri Thompson adds "this large piece of coal has been the 'star' of a film which traced the journey of coal from the valleys down to Cardiff Docks. The coal itself was on display in the National Museum Cardiff for a few months but is now resting in our Collections Centre in Nantgarw". With the roundabout removed, the second, larger, coal 'lump' was installed on a slabbed area outside the main entrance doors. The photograph alongside was taken in May 1993, showing this second 'lump'. 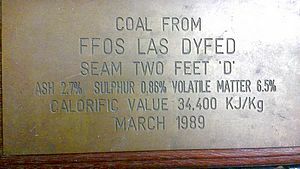 The coal was mined from the Seam Two Feet 'D' at the open-cast site of Ffos Las, in Dyfed, in March 1989 and is a true anthracite (see the inscription on the accompanying plaque). Martyn Davis tells us that "Stuart Adair had to build a plinth to stand it on as the chosen site (see left) wasn't level over sufficient area". That later anthracite 'lump' is now stored at the Hopewell Colliery Museum in the Forest of Dean. My Thanks to 'Rich' Daniels for telling me this and confirming it with photographs. The view below was perhaps taken the same day as the above. By including more of the surrounding countryside, with its homes and farms, this is an interesting view for anyone researching Stoke Orchard village. 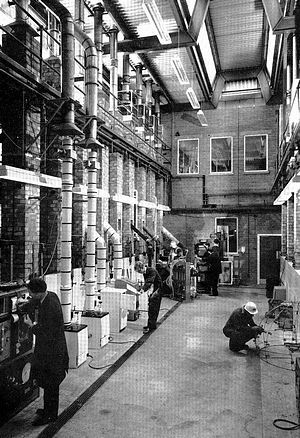 Below is shown a view inside the Domestic Heating Laboratory, as it appeared in the visitor's guide to the June 1970 'Open Days'. A copy of the Visitors Guide to the June 1970 'Open Days' can be downloaded as a pdf file by clicking here or on the small image alongside. The centre pages of this guide includes a site map to assist visitors to move around the site and to find specific exhibits. That site plan still labels CRE as CRE 1, referring to the 'split' that took place in 1952. CRE as illustrated on the cover of the 12th and 13th June 1970 'Open Days'. Compared to the previous 'early 1960s' view, the northern end of the site (the right hand side) has further process buildings, but otherwise looks much the same. At that time the site Library was located in an office off the main entrance foyer of the new building, though already held "...about 8,000 books and bound periodicals, about 10,000 reports, reprints and similar....and subscribed to about 250 current periodicals". An extension building off the entrance foyer provided a much larger library in the mid-1970s. Perhaps the reason for CRE not expanding much during the 1960s is in part due to the 1960s being a painful decade for the British coal industry; colliery closure, a decline in overall output and employment and a depletion of known reserves were characteristic features. The great reconstruction of the mining industry during the 1950s, following coal industry nationalisation, had brought coal production back to a 1957 peak of around 228 million tonnes. But thereafter, decline set in, as imported oil, nuclear power and natural gas began to compete heavily in certain markets; further decline in coal demand was predicted by a 1967 White Paper on fuel policy and led to accelerated colliery closures. By 1974, coal annual production was down to around 110 million tonnes. For much of the 1960s the CRE Director was Dr.D.C.Rhys Jones, who had been Deputy Director under Dr.Bronowski. He was certainly in-post as Director during the early 1960s and authored a paper in New Scientist magazine for 7th May 1959 describing new methods of producing smokeless fuels with which the Board were experimenting. It is likely that he remained in-post until 1968, when Dr Joseph (Joe) Gibson became Director. The early 1970s saw two confrontations between the National Union of Mineworkers (NUM) and the Conservative Government led by Ted Heath. The NUM action did not directly impact upon CRE, which was solely part of the British Association of Colliery Management (BACM) union, but this history would lack a noteable occurence without mention of this turbulent period. Some CRE staff did were temporarily redeployed to NCB sites affected by the NUM strike e.g. smokeless fuel plants, and although they suffered a degree of verbal abuse when entering such premises, no one reported 'heavy hand' tactics. The first strike occurred in 1972 over pay. It began on 9th January 1972 and ended on 28 February 1972, when the miners returned to work after accepting an improved pay offer in a ballot. During this strike, all 289 pits in England and Wales stopped work. By miners picketing power stations, the strike led to electricity cuts of up to 9hours a day around the country, on a published rota basis. Less than two years later, on 12th November 1973, the NUM began an overtime ban, which swiftly led to the Government declaring a state of emergency, as concern increased over inadequate coal reserves at power stations. The miners action was against the Governments anti-inflation policies. Throughout 1973 a series of Bills had passed that restricted income and put strict limitations on pay rises. The miner's overtime ban caused Prime Minister Edward Heath to announce, on 13th December 1973, a series of measures to conserve fuel in the United Kingdom. For a fortnight from the 17th until the 30th December, industrial and commercial energy users would be restricted to only five days of energy consumption. From the start of the new year, the restrictions would be increased to only three days of consecutive energy consumption a week  essentially enforcing a three day working week. On the 9th February 1974, a full miners strike commenced. The failure of Heaths Government to effectively avert a mass strike was a key factor in its defeat in the national election of February 1974. The strike came to an end on 6th March, following an agreement between the NUM and the new Labour Government, under Harold Wilson. The Three Day Week was itself ended on the 7th March 1974. For many, the Three Day Week, and later the 'Winter of Discontent' under James Callaghan's Labour Government in 1978-79, symbolised the increasing power of trade unions to disrupt the whole country. The fear that trade unions could hold the country to ransom was a key contributor to the election of Margaret Thatcher's Conservative Government in 1979. By the time a Labour Government again took power in 1997, British Coal had been privatised, was vastly reduced in size and had lost all industrial influence. Although impacting on the UK's economy, the fortunes of the UK's coal industry dramatically improved as a consequence of the 1973 oil crisis, which began in October 1973 when the members of the Organization of Arab Petroleum Exporting Countries (OAPEC, consisting of the Arab members of the OPEC plus Egypt, Syria and Tunisia) proclaimed an oil embargo. The embargo was a response to American involvement in the 1973 Yom Kippur War. Six days after Egypt and Syria launched a surprise military campaign against Israel to regain territories lost in the June 1967 Six-Day War, the US supplied Israel with arms. In response to this, OAPEC announced an oil embargo against Canada, Japan, the Netherlands, the United Kingdom and the US. By the end of the embargo, in March 1974, the price of oil had risen from $3 per barrel to nearly $12. The oil crisis had many short-term and long-term effects on global politics and the global economy. It was later called the "first oil shock", followed by the 1979 oil crisis, termed the "second oil shock." The escalation of oil prices required a UK reappraisal of the competitiveness of its neglected indigenous coal resources. Thus, the retreat from coal, that had characterised the 1960s, was halted. The National Coal Board (NCB), backed by the militant National Mine Workers' Union (NUM), exploited the sudden reversal of its fortunes to gain government acceptance of its ambitious 1974 'Plan for Coal'. This stressed the long-term importance of coal in British energy policy, arguing that investment in new capacity was vital to equip the industry to sustain and expand production to meet the day, probably in the 1990s, when an 'energy gap' might reappear when North Sea oil and gas wells began to run dry. British industry had relied heavily on coal for much of the 1950s, but had substantially moved away from coal during the 1960s when fuel oil had become relatively low priced. However, the 1974 OAPEC 4-fold oil price increase risked UK industry becoming uncompetitive in worldwide markets unless a lower cost fuel could be provided. A difficulty in coal winning back industrial users was that, during the previous 20 years, industry had become used to automatic clean operation of its combustion processes when burning fuel oil, so coal needed much development to make it acceptable again to industry. It also had to satisfy increasingly stringent stack emission legislation (1956 and 1968 Clean Air Acts) and also general public perception; they would no longer tolerate their local air quality being polluted by dust, or finding chimney smuts on their washing. The Marketing Department of the NCB (CRE's source of funding) tasked CRE with developing technologies and equipment necessary to achieve an increase in UK coal use from around 110 million tonnes per annum to (optimistically) 150 million tonnes. The electrical power generating industry (the nationalised CEGB at the time), consumed around 85 million tonnes per annum and this was unlikely to change unless by demonstration of new, environmentally clean, processes, operating at higher thermodynamic efficiency. One such demonstration process was the application of pressurised fluidised bed coal combustion (PFBC) within a combined gas and steam turbines cycle. Originally developed at the BCURA laboratories between the late 1960s and early 1970s, a large scale prototype was built at Grimethorpe colliery, in S.Yorkshire, from 1977, which was initially directed by various co-ordinating bodies and came under the day-to-day management of the British Coal Corporation's (née the NCB's) CRE by 1990. But such major R&D projects have a long lead time before they can make a material increase in coal sales. Shorter term opportunities for additional coal sales lay within the industrial, commercial and domestic heating sectors, and also in the iron and steel industry. In pursuit of these 'shorter term' opportunities to extend coal use, 'Plan For Coal' instigated an increase in the number of employees at CRE by the substantial growth of industrial combustion R&D, especially through the application of shallow fludised bed technology. Two Branches provided this effort viz; Appliance Development (AD) Branch and a newly created Branch named Industrial Development (ID). There was also additional new staff employed in similar pursuits via gasification projects, applicable to industry and (in the longer term) to power generation. These employee numbers raised the need for a further extension to the 'new' office building. However, an unplanned event occurred that further impacted on the need for additional office space. 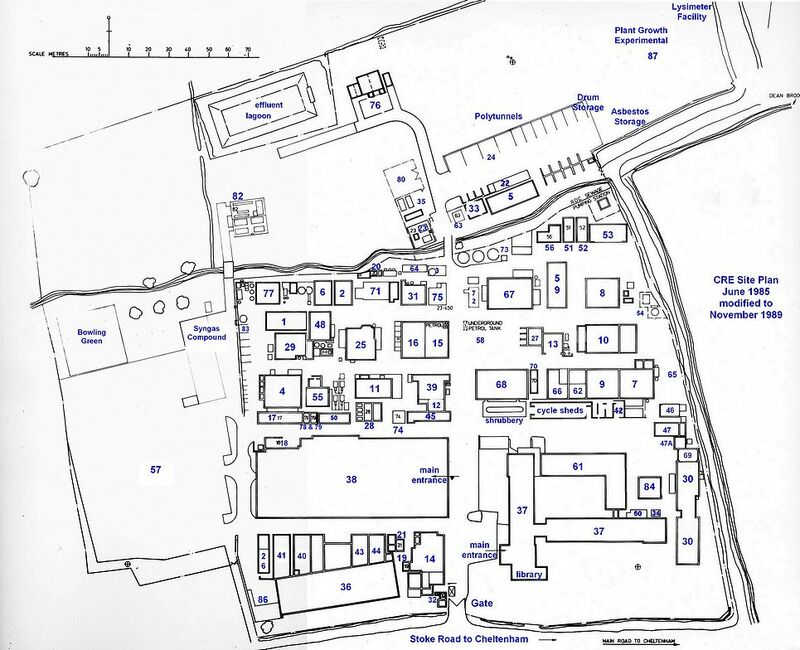 In late 1973, maybe early November, a serious fire occurred along the upstairs corridor of the 'new' office building (Building 37 on the site plan, below) that (in Mike Vicker's words) "gutted the ....Chemistry Department....... 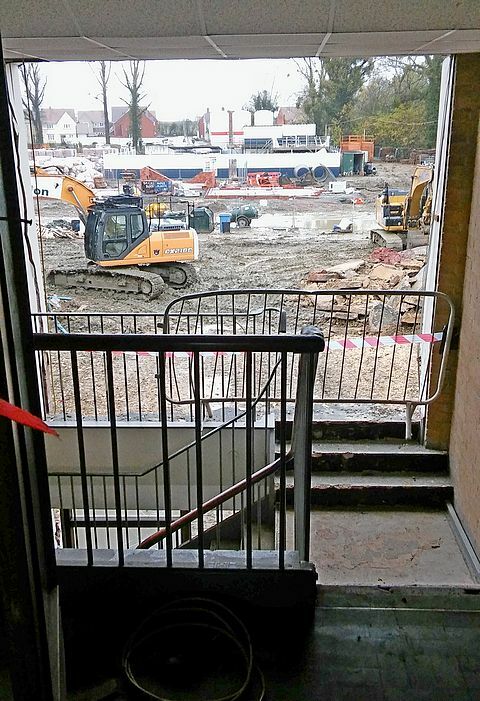 The front entrance to the main building was off limits during the lengthy repair/rebuild of the upstairs laboratories. .....the reception area was still being revamped after the staff had moved back into the upstairs laboratories. The staff had previously to move into the Hangar Building for about 18 months (during the repair)". 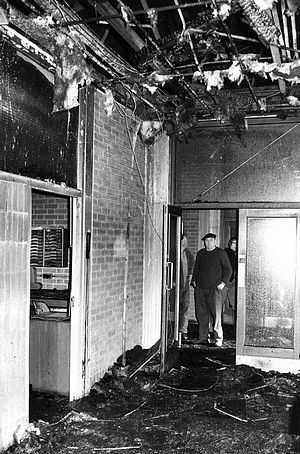 Photographs of the fire damage were taken on 12th November 1973 and show that first floor rooms numbered 120 to 144, so perhaps 12 rooms on either side of the upper corridor, had suffered considerable damage. This was in the arm of the 'L' block facing east-west, maybe 1/3rd of the way along from the entrance foyer. The photograph, left, is the corridor outside room 125. 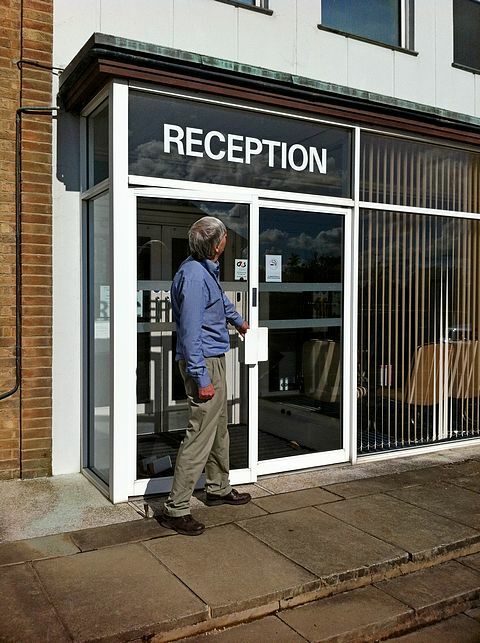 Martyn Davis tells me "the man stood in the doorway is Fred Jeynes. He looked after the ground working team consisting of 'Nippy' Gilder, Derek Williams, Gerald Heath and others. He is probably there to start clearing up the mess". At this time, the Director at CRE was Dr. Joseph (Joe) Gibson, who became Director in 1968. The Directorate decided to take advantage of the need for substantial repair to what was known as the 'new' office building, to also add the additional 'L' block as shown below, making the original 'L' into a square arrangement, resulting in a surrounded central grassed area serving as a croquet lawn. This area had previously been the main site car park. Hence, as a prelude to the building of the additional office block, a new car park had to be created on land to the western end of the Hanger Building. Other buildings were added to the 'new' office block. (ii) a new library building was added to the southern end of the main entrance foyer, accessible to the right after passing through the foyer. This is the low height building in the centre foreground of the picture below, kept below the eye-line of people using the upstairs main conference room. The somewhat taller building to the right of the library, provided further library services and also an upstairs storage area. The completed 'new' office building, as shown below together with its ancillary buildings, were formally opened by Dr.J.Gibson, by then Board Member for Science, on 30th November 1977. The polished metal plaque shown left was wall mounted just inside the entrance leading into the additional 'L' shaped block (opposite corner to the main entrance), to commemorate this event. With Dr.Gibson becoming NCB Board Member for Science, the role of CRE Director was taken up by Dr.David Dainton, with Jack Owen as his Deputy Director. 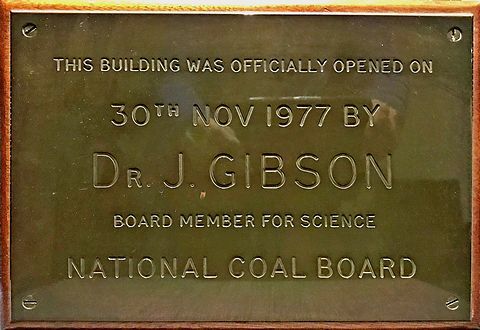 The plaque was removed by Martyn Davis at the time of the CRE site closure and Dr.Bill Kaye passed it on to Carole Gibson, Dr Gibson's daughter. Carol Minter, who joined CRE as site librarian in (coincidentally) November 1977, arranged with Carole Gibson for this photograph to be taken. The aerial view shown below dates to around 1990, by which time the Test Boiler House, with its two spiral wrapped chimneys and coal silos (left background), had been erected for novel boiler developments. An Exhibition Hall had also been erected, between the Test Boiler House and the 'new' office building, where a variety of technologies could be demonstrated to visitors. Following the 1974 'Plan for Coal', CRE site was a hive of enthusiastic activity in every aspect of coal science and its practical application. The industrial combustion Branches, AD & ID, not only carried out their R&D work at CRE but also frequently attended large scale industrial demonstration projects and commercial installations incorporating newly developed technology, sold by UK manufacturers to new and existing coal customers. These provided automatically operating boilers and hot gas generators. Click the image to the left, or here, to download a pdf of a 1978 advertisement by the NCB, placed in 'Processing' magazine for May 1978, expalining about the new coal burning technolgies that were being developed and how the UK had 300years of indigeneous coal reserves. 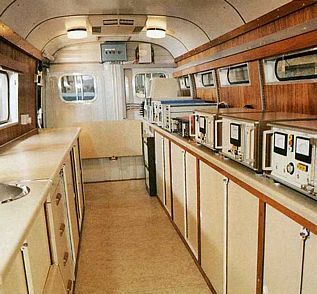 The domestic heating laboratory staff had their own test houses at CRE site but also attended and monitored household customer trial sites in 'the real world'. CRE's fluidsed bed technology was sold worldwide via a licensing organisation called Combustion Systems Limited (CSL), while making the 'know-how' freely available to manufacturers who applied it to the commercialisation of appliances that burned UK coal. The development of high thermal efficiency 'clean' coal power generation technologies progressed, both at Grimethorpe Colliery, with its large scale Pressurised Fluidised Bed Combustion (PFBC) test rig, and also at CRE, carrying out practical, though small scale, 'Topping Cycle' developments that subsequently became known as the Air Blown Gasification Cycle (ABGC). Directorate called upon CRE staff, as well as their own experiences, to produce frequent papers for conferences and other publications, explaining the in-depth knowledge that had been acquired on the subject of coal and all its applications, both current and potential. Click here to download a pdf of two chapters which eventually formed the basis of sections of the book "Coal Utilisation: technology, economics and policy", authored by Leslie Granger and Joseph Gibson (Graham & Trotman, 1981). Coal was, at that time, still seen as having a long term future and indeed there was uncertainty around 1980 about the long-term availability of oil and gas. This encouraged the thought that coal might one day be the source of fuel gas (as in the pre-1970 past) and also oil and other petroleum products. A 'paper' by Dr Gibson, with its origins in the late 1970s but formally presented at the Proceedings of the Institue of Petroleum, in 1982, entitled "Coal - The Fuel of the Future", can be downloaded as a pdf by clicking here, or on the small image alongside. On a less serious note, but also dating from 1982, is this (shortened, it actually runs to about 90 pages) version of "Cresset", which was a satiral magazine produced by the staff in the jovial mood leading up to the Christmas holidays. John Eckersley drew the front and back cover pictures of this issue. The front cover drawing of a Bunsen burner / candle is in the shape of a key, suggesting this was Cresset's 21st year of publication. So it's possible that it started being produced in 1961. The content is tame by modern standards, but it was an opportunity to poke a small finger of fun at the site's senior staff and administration. The shortened version can be downloaded as a pdf by clicking here, or on the image alongside. Some noteable success was achieved by CRE in encouraging interest in coal use by industry and commercial organisations (e.g. hotels and hospitals). Coal production steadily rose during the years to 1980, when it peaked at 130 million tonnes. However, unrest and subsequent strike action by miners belonging to the National Union of Mine Workers (NUM) began a coal sales decline that was never subsequently halted. If the decline attributable to pending strike action is ignored, then UK coal useage averaged 125 million tonnes during the 8 years following implementation of the 1974 Plan for Coal, a 15 million tonnes per annum increase. A number of glossy A4 size booklets were produced at this time for general marketing use and information dissemination to visitors and customers / potential customers. Alongside is the cover of 16 page boklet entitled "Clean Use of Coal", giving a brief summary of all the investigative environmental work being carried out at CRE. It was published by the British Coal Corporation in 1987. To download it as a pdf, click here or on the small cover image. For around 15 years, the development of shallow fluidised bed combustion was a major topic within ID and AD Branches, occupying maybe 50 people with support staff. Staff were employed not just at CRE but also some were 'out-stationed' to trial and commercial large scale installations, ensuring smooth day to day running of important factory equipment and liasing with the factory management. This A4 booklet on a whole range of fludised bed developments in progress at CRE and available for industrial installation by commercial organisations, was the 2nd in a series of three that were published between 1980 and 1988. it was published in 1985, when the coal industry was still run under the banner of the NCB. To download a copy as a pdf, click here, or on the small image alongside. 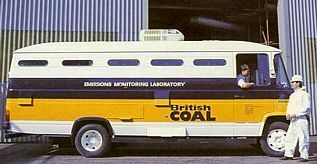 Just as a range of novel coal utilisation developments were coming to fruition at CRE, and being taken up by commercial organisations that were installing these new technologies on industrial sites, a miners' strike occurred during March 1984 to March 1985. It was led by Arthur Scargill of the NUM against the NCB. Opposition to the strike was led by the Conservative Government of Prime Minister Margaret Thatcher. The NUM was divided over the action and many mineworkers, especially in the Midlands Region, worked through the dispute, which was an attempt to halt ongoing colliery closures. During the strike certain UK industrial coal supplies were disrupted and coal imports were sanctioned by the NCB to maintain supplies. Despite the strike, work at CRE continued much as before, though it was clear that industrialists were now less keen to risk converting to coal than had been the case in 1980. The number of new industrial combustion projects dwindled and a reorganisation of CRE staff began. As the decade progressed, phrases such as 'Early Retirement' and 'Gardening Leave' became ever more commonly heard. After the 1984 strike, colliery closure accelerated as coal came under further attack as an undesirable 'dirty' fuel by the growing Climate Change lobby. More than 1,000 collieries were working in the UK during the first half of the 20th century; by 1984 only 173 were still operating. 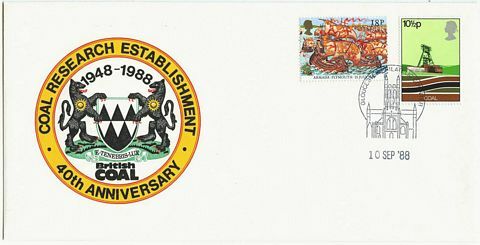 Pride in the Establishment continued despite the set-backs, as illustrated by this 1988 'Commemorative Issue' envelope, of which 300 were produced and circulated to CRE staff members. This one has the Cover Number 140. I believe the order in which they were issued was democratically determined by a 'raffle ticket' draw. Each envelope contained a card, signed by the (then) Director, Dr David Dainton, with a brief explanation of the formation of CRE in 1948 and the work accomplished over the intervening 40 years. The envelopes were 'franked' by the Gloucester Philatelic Counter on 10th September 1988. Design was by two of my ex-colleagues, Eric Smith and Tony Isles. Artwork is attributed to Frank Lappington. Printed by the Reliance Printing Works, Halesowen, West Midlands. (July 19th) 1988 400th Anniversary of the Spanish Armada. Around 1989, Mr James (Jim) Harrison became CRE Director, taking over from Dr Dainton, with Dr John Whitehead as his Deputy Director. Later (around 1991) John Whitehead became Director and it was he who had the unenviable task of preparing CRE for the inevitable effect resulting from privatisation of its parent nationalised coal industry, known (since 1987) as British Coal Corporation (BCC). The author of this brief historical account did not join CRE until late 1978 and so the following brief notes serve mostly to record personal memories of the organisation that he joined and the way in which this organisation changed and developed over the subsequent years up to the time that coal technology R&D came to an end in 1997. CRE was divided into various Branches, each with their separate R&D responsibilities under a Branch Head and a Deputy Branch Head. Above them came a Deputy Director (CRE sometimes had more than one Deputy Director) and finally the Director himself. Staffing levels varied but was typically 350, though I understand this figure may have peaked nearer to 500 in earlier decades. A Finance and Administration Department handled all financial transactions (though not staff wages) and included the staff Personnel Department, later to become known as Human Resources. The following description provides mere 'snap-shots' of the way CRE was organised from the 1970s through to privatisation. The structure was necessarily 'fluid' and changed significantly over time to reflect the industry's need to stay abreast of sales opportunities, arising technologies and environmental concerns. There was much emphasis on carbonisation and briquetting through until the early 1970s, followed by an emphasis on industrial combustion and gasification during the 1970s and 1980s followed by advanced 'clean coal' power-generation development taking prime position in the late 1980s and into the 1990s. This latter change was prompted by ever more vociferous concerns over Climate Change, that criticised high CO2 stack emissions from coal burned in low thermal efficiency (around 37%) pulverised coal fired power stations. This was old technology, developed in the 1920s that had become the UK's base load power production technology, consuming around 85 million tonnes of UK coal annually. From the mid-1980s, CRE began working on 'clean coal' power generation technologies with 20% higher thermal efficiency which, with the addition of carbon capture and storage (CCS) technology, would have substantially reduced atmospheric CO2 emissions. 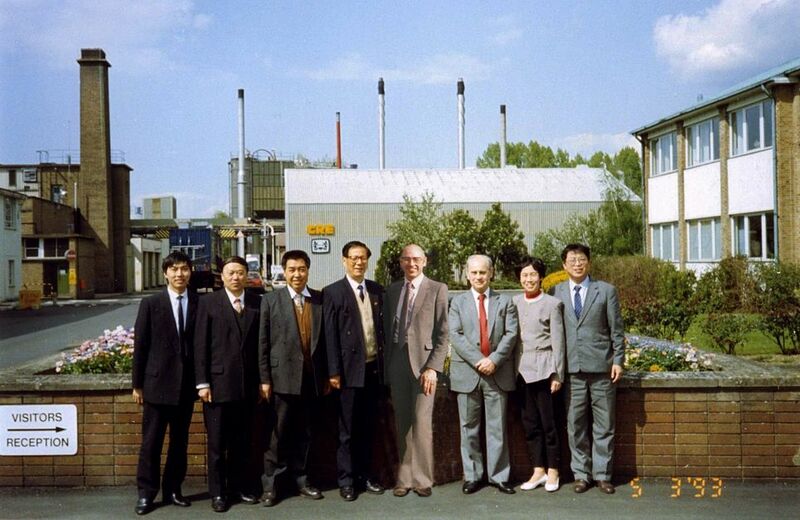 This continued until the very end of coal R&D at Stoke Orchard, in 1997. Coal liquefaction was a long term project that spanned (at least) the last two decades, awaiting the time when oil became scarce and oil prices rose sufficiently to make 'oil from coal' an economic proposition. Appliance Development Branch (AD) was responsible for the practical development of new industrial and commercial coal combustion systems. AD Branch Staff were based exclusively at CRE, though certain developments were installed at trial sites and the AD Branch personnel responsible for their development spent time at the trial sites setting them up and assessing their performance. Industrial Development Branch (ID) worked closely with AD Branch. Its responsibilities were exclusively away from CRE, though for many Branch Members, CRE was their office base. Other ID Branch staff were out-stationed where they could be more regularly and conveniently in contact with trial sites. These trial sites were generally large industrial installations, often sold by an equipment manufacturer to a coal customer who knew that he could rely upon NCB-CRE for support during the initial years of his (novel) equipment being installed. AD and ID Branches overlapped in many areas, especially in the major development of shallow fluidised-bed combustion, as applied to industrial boilers and furnaces (hot gas generators). Domestic Heating Branch developed and type-tested (often for manufacturers) home heating appliances. These almost always burned some form of natural (anthracitic) or man-made (smokeless) fuel, in glass fronted room heaters, or hopper-fed central heating stoves. They also developed a form of room-heater that could be fired on bituminous coal, called a 'smoke eater'. External (to CRE) customer trial sites were monitored for 'real world' information and, by the late 1980s, two semi-detached houses were built on CRE's site where similar testing and sales demonstrations could take place. Environmental Control Branch (EC), as its name implies, studied coal-based environmental impact. Mostly the work related to stack emissions, both particulate and gaseous, but it also investigated measures to make mining and combustion residues benign. Gasification Branch developed efficient means of converting coal into fuel gas, either for direct application to industrial processes or as part of a combined gas and steam turbine power-generation 'topping' cycle. Coke oven gas and mines gas were already well established areas of commercial combustible 'gas from coal' sales operated by the NCB - BCC, and Gasification Branch sought to extend the market for such sales, especially in anticipation of an eventual decline in North Sea natural-gas supplies. Coking studies of coals suitable for use within the iron and steel industry, either for manufacturing metallurgical coke or for direct blast furnace injection, were also carried out under the direction of David Price, who joined CRE in the 1950s, working with Jacob Bronowski. Liquefaction Branch studied solvent extraction of chemicals from crushed coal that were then used in the manufacture of liquid fuels, including a synthetic petrol for motor vehicles. It is claimed that CRE became home to a Ford Torino fitted with an experimental engine capable of using this oil as a demonstration vehicle, but I never saw such a car. However, a lawnmower driven by Sir Derek Ezra (then Chairman of the NCB), a dumper truck driven by John Moore (Under-Secretary of State for Energy; 1979-1983), and Automobile Association (AA) vans in the Lord Mayor of London's procession, are more substantive claims. Despite the rise in oil price during the 1970s, coal liquefaction remained an expensive process (at that time ~ 1980s). Nonetheless, construction of a 2.5 tonnes/day pilot plant was started in late 1986 at Point of Ayr Colliery, on the Dee Estuary, N.Wales. But the decision to build this pilot plant came too late, commissioning was protracted, and it was 1992 before meaningful test work began. It was closed at the end of 1994. Project Assessment & Development Branch (PADB) studied new concepts to ascertain their likely benefit to the NCB-BCC. During the 1980s, PADB also became responsible for setting the CRE budget, department by department. This was a significant exercise involving lots of negotiation and lobbying. As such it had a lot of hidden influence. PADB also played an important role in the formation of the IEA GHG programme (see lower down this page). Analysis and Basic Studies Branch (A&BS) encompassed a full range of analytical procedures, both physical and chemical, and carried out fundamental studies, often supported by EEC funding. The analytical services, including metallurgical and coal ash constituent corrosion and fouling, were offered as a support role to the work of the several 'front-end' Branches (see previous). Physics Dept, which gave support to the front-end Branches, often by designing, constructing and operating cold models; they ensured that modelling techniques took account of the differences between those in the model and those pertaining to full scale application. Results were analysed and reports made to the Branch for which the support had been requested. Mathematics Dept was another support service that provided high level mathematical modelling. Also, with the advent of micro-computers, it took on the role of IT support. Photographic Dept produced high quality photographs as prints and slides, both of activities at CRE site and also at external locations where development work was in progress. They also prepared schematics as 35mm slides to enable easy explanation of processes during presentations. Engineering Branch gave an on-site service to those Branches involved in the design, construction and installation of CRE-based test rigs and large scale demonstration projects. They were also responsible for the overall maintenance of the site and the supply of services (heat, light and power). Library services were to a high standard. The CRE library contained a fully card indexed collection of text books, reports and periodicals. Any reports that were referenced in external papers, and were not already in the library, were obtained from international sources. A list of the contents of CRE library at March 2001, can be downloaded as a pdf file here. Download as a PDF by clicking here or on the image alongside. Science Branch. In 1989-1990 this comprised three Groups, namely Physics Group (including Mathematics), Basic Studies and Environmental Science. It is interesting that neither Gasification nor Coal Liquefaction featured, any longer, as standalone entities. Gasification became part of Power Generation Branch, who were studying the gasification of coal within air-blown Circulating Fluidised Bed Combustion (CFBC) as part of their Advanced Power Generation R&D. Liquefaction (essentially by then carried out at the Point of Ayr demonstration plant) is thought to have received CRE support via Science Branch's Basic Studies Group, with further support from Analysis and Testing Branch. "Innovation For The Clean Use of Coal", the 1988 Robens Coal Science Lecture given by CRE Director Jim Harrison, 3rd October 1988. "A History of Coal Liquefaction in the United Kingdom", 1967-1992, by Geoff Kimber. "UK Overview of Fluidised Combustion Developments", by Dr W.G. (Bill) Kaye. The International Energy Agency (IEA) is part of the Organisation for Economic Co-operation and Development (OECD). The aim of the IEA is to foster co-operation among the twenty-four participating countries in order to increase energy security through diversification of energy supply, cleaner and more efficient use of energy, and energy conservation. The IEA was established in 1974 following one of the so called oil price shocks instigated by middle eastern countries via OPEC (Organisation of Petroleum Exporting Countries). Amongst its first actions was to establish the IEA Clean Coal Centre (IEA CCC) with British Coal as Operating Agent. This has its H&Q in London and is a leading producer of unbiased research on the global use of coal. After the privatisation of British Coal, the operating agency function was passed to CRE Group Ltd (a privatised consultancy formed from CRE-BCC; see below). IEA CCC still operates (2017) and for the past 17 years its Director has been an ex-CRE senior person. Several other ex-CRE staff have worked for it and some continue to do so. Another IEA operation is the IEA Greenhouse Gas R&D programme which began as an exercise pertinent to British Coals strategy to defend the importance of coal in the global economy. It formally came into existence in 1991 and operated from CRE Stoke Orchard using (originally) several CRE-BCC staff and later a number of employees of CRE Group Ltd. It was the late 1980s when wide concerns started to emerge about global warming without too much supporting evidence at that time. But it was becoming a concern to British Coals main Board. So, CRE was asked by Malcolm Edwards, then BCC Commercial Director, if there iwas anything that could be done technically to alleviate CO2 emissions, particularly from power plant. It was well known that amines could extract CO2 from flue gases, but that it would add as much complexity as Flue Gas Desulphurisation (FGD), and with all the commensurate costs to power production. CRE's Process Assessment and Development Branch (PADB - see above) used their mathematical process models to investigate and its first Branch Report on the topic was published around 1989. CRE Management spent a lot of time travelling, presenting and generally getting governments and power industries to take an interest in establishing the IEA Greenhouse Gas R&D Programme. A dozen countries signed up and it came into force in November 1991 with British Coal - CRE as the Operating Agent. Despite the closure of British Coal and CRE, this work is still on-going 26 years later (in 2017). Its Director for the past ten years has been an ex-CRE and ex-CRE Group employee. The plan below shows the overall CRE site layout, essentially as it looked from 1985 to privatisation in September 1994, through combining information from November 1989 and August 1994 drawings. The 'key' beneath indicates building designations and uses. Note that it includes a pre-fabricated building No.84, that housed the fledgling IEA Greenhouse Gas R&D Programme staff. The story now moves on to 1993, by which time, to quote Steve Wright, "It was clear to all that with the sale of the rump of the coal mining industry to the 'Private Sector', CRE could not continue in anything like its existing form. If there was no UK coal industry to speak of, an establishment the size of CRE Stoke Orchard, with 300 to 400 [300 by then] employed, would be difficult to sustain or justify". The UK coal industry, and CRE along with it, was inevitably going to be impacted by an exciting new world of privatisation. Senior Management must have been aware, even at the start of the decade, of the substantial changes facing the UK coal industry and the inevitable consequences for CRE. In the early 1990s, before privatisation was even announced, CRE formed a Consultancy Branch and started seeking paying customers outside of the coal industry. Even coal customers were expected, depending upon circumstances, to make some payment for technical assistance they had previously received 'for free'. Overseas coal and environmental consultancies began around 1991, with World Bank sponsored missions to China and also TACIS sponsored missions to Russia. The A4 booklet alongside, entitled "CRE Review" was produced to act as a marketing tool for the skill set available within the CRE work force. To download a copy as a pdf file, click here or on the small image alongside. The opening paragraph reads "During 1991 we undertook a fundamental review of our business, which resulted in the formulation of a new strategy, based on our existing range of activities, but with a substantially enhanced customer base. At the same time, we restructured our organisation and programme, with effect from March 1992". A newsletter appeared around this time, called "CRE News", probably intended to prepare the CRE work force for the new circumstances and pressures they were to find themselves working under. It was 'upbeat' in its approach, reassuring everyone that plans were in place to meet any new challenges. The May 1992 issue can be downloaded as a pdf by clicking here. Two years later, the reality of privatisation proved less assured than the optimistic impression to be gained from these documents. In mid-June 1994, John Whitehead made an announcement about CRE's future. It was proving impossible to reconcile the various functions of CRE and therefore it would have to be split. Those areas of business which were thought to have a long-term future (five years or more?) would be bundled into a new company called 'CRE Group Ltd', a subsidiary company of British Coal, for which bids would be invited from the Private Sector. The new company would have a portfolio of activities including consultancy, technical support services and small-scale research. Thence, the Stoke Orchard workforce was divided into three parts. An 'A team' of employees was allocated to CRE Group, a 'B team' was allocated to a new Coal Technology Development Division (CTDD) and a 'C Team' were offered more or less immediate redundancy. Very roughly, the approximate remaining 300 workforce (some had taken voluntary redundancy in the preceding years) were apportioned near equally between these three Groups. The split into CRE Group and CTDD was timed to occur on 1st September 1994. The Liquefaction demonstration plant at Point of Ayr, North Wales, came into CTDD, with a similar short-term future. The total CRE site was sold to IMC Group Ltd when they won the bid to purchase CRE Group Ltd in 1995. The industry-wide administrative functions of British Coal were transferred to a new authority, the Coal Authority, and all economic assets were privatised. The English mining operations were merged with RJB Mining to form UK Coal plc. British Coal was wound up on 26th January 1997. The area of CRE activity that would not be privatised was its advanced power generation R&D programme, by then no longer known as the British Coal Topping Cycle but instead called the Air Blown Gasification Cycle (ABGC). The ABGC was one of a number of Gasification Combined Cycle (GCC) power generation arrangements being investigated worldwide at that time, for their benefit of substantially higher power generating efficiency and lower stack emissions than are achievable with conventional pulverised coal fired plant. CRE were not involved in any full-scale ABGC power plant demonstration. For several years prior to the creation of CTDD, CRE had been operating various pilot-scale research rigs, primarily to demonstrate their novel gasification process (two-stages; a fluidised bed gasifier and a circulating fluidised bed for residual high carbon char combustion) and a test rig for developing what became known as the 'Hot Gas Clean-up' process (invloving chemical sorbents and ceramic element filtration). The work on these test rigs needed to be completed, and it was to this end that the new 'Coal Technology Development Division (CTDD)' was created. No long-term future was seen for CTDD; any further large-scale research for ABGC would have to be carried out by interested industrial partners. "Air-Blown versus Oxygen-Blown GCC", by M J Fisher. 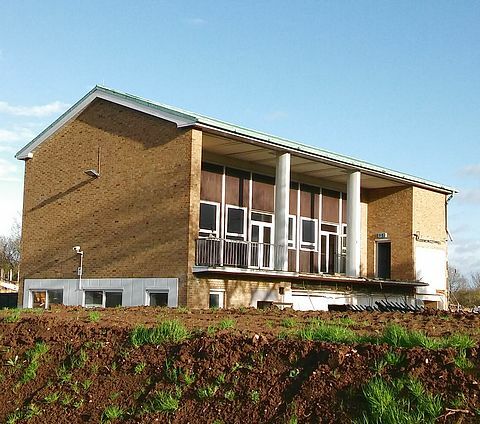 CTDD occupied the original 'Hanger Building', as acquired by the NCB from Roy Fedden in 1948, and continued to access this and other process buildings on the west side of the site until CTDD's work came to an end in December 1997. 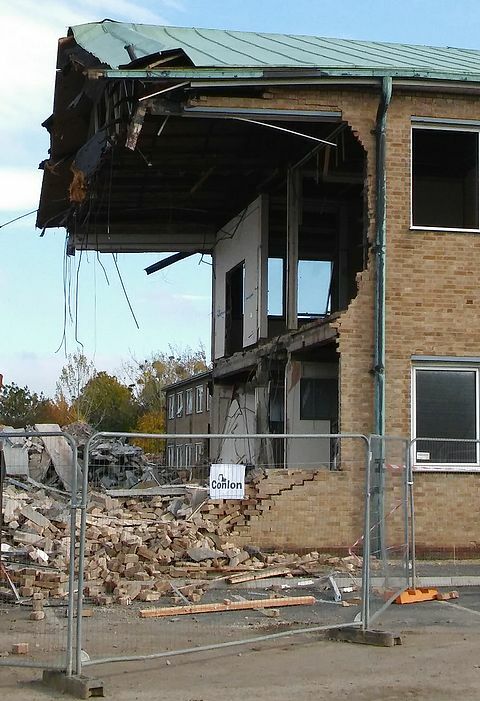 Thereafter, all the site buildings, apart from the 'New' laboratory & office building occupied by CRE Group Ltd, started to fall into disrepair. Photographs of this area of the site after 10-13 years of decay, can be seen here (November 2007), here (26th March 2008), here (25th January 2009), here (February 2009), here (26th June 2010), here (June 2010), and here (believed also to be June 2010). Dr John Topper joined CRE in 1975, becoming Deputy Head of Industrial Development Branch (ID; under the excellent Doug Willis) and subsequently ID Branch Head (within 1981-88). He then became Head of Project Assessment and Development Branch (PADB) from 1988 and was also Secretary to the Director's meetings. It was John Whitehead (CRE Director) and John Topper who together envisioned an employment future for a select team of CRE employeees, to carry out overseas consultancy work at 'margins' that would secure not only the salaries of Group's more expensive staff, but also help to support 'low margin' work for other staff working in the UK e.g. domestic and industrial combustion and environmental stack monitoring. It was on that basis that British Coal was persuaded to set up CRE Group Ltd. John Whitehead became Managing Director of the new CRE Group and John Topper became Commercial Director. 95 staff initially joined CRE Group. Ownership of CRE Group Ltd went to tender in 1995 and the front-runners were a Management Buy-Out (MBO) and International Mining Consultants (IMC) Group Ltd. The IMC bid was successful and included purchase of the whole CRE site. IMC subsequently sold the site for housing though with CRE Group (and its successors) retaining a long lease (20 years ?) for its part of the site, being within the 'new' office block to the right of the site entrance. CTDD occupied the main hanger building, though CTDD was already (or near to) being closed by the time of the site's sale. Group management knew that, without an expectation of winning high margin overseas consultancy projects, CRE Group would not have gotten 'off the ground' and 95 people would not have benefited from a further 6+ years employment. Taking part in such projects was not new to certain CRE staff, as the future commercial value of developing an overseas consultancy capability had been recognised by 1990. Early projects were carried out in the People's Republic of China and variously in the former Soviet Union. The list below is likely incomplete, but shows the overseas consultancy work undertaken in the early 1990s (while staff were still employed by CRE-BCC) and follows through into an extensive period of 6 years for CRE Group. ODA funded study of coal based energy production in PR China, Taiyuan City (1992-1993). World Bank Global Environment Facility (GEF) study with PR China Ministry engineers examining "Issues and Options in Greenhouse Gas Emission Control ~ Pre-Feasibility Study on High Efficiency Boilers" (1992-1993). A UK Know How Fund study on the whole Russian coal industry examining coal use and the needs for improved coal marketing and coal preparation. (1993-1994). UK Know How Fund study in Kazakhstan. Scope of the study included examination of the existing power distribution system, the fuel supply and performance of fossil fuel fired stations, possible investment needs and feasibility studies on introducing environmental controls and clean technologies. (1993-1994). Tacis project investigating feasibility of retrofitting circulating fluidised bed technology to a low quality solid fuel using power station in Ukraine. (1993-1994). This was taken up by the EBRD and led to a $130 million line of credit for construction. UK Know How Fund study in Ukraine involving power station fuel testing, evaluation of environmental control investment possibilities, and training in project evaluation techniques relating to power stations. (1994-1995). Assistance to Interconsult (Norway) on a World Bank funded project to PR China, Liaoning Provincial Planning Commission, Shenyang: Benxi Air Quality and Energy Management Study (BEAQMS), (1994-1995). An Asian Development Bank study into air quality in Almaty and how it might be improved by replacement of coal fired power and heat systems with new technology (1995). Tacis project on developing coal briquetting for export sales in Ukraine (1995-96). Asian Development Bank project on feasibility of upgrading gas generation in 4 different Chinese industries (1995-96). Tacis project to set up an Energy Centre in Novosibirsk (1995-97). Tacis project to demonstrate Fluidised Bed Combustion in Tula (100miles south of Moscow) of their indigeneous brown coal in a 1MWthermal district heating boiler. ODA funded PR China Guizhou and Shanxi Energy Efficiency (GASEE) project (1996-1999). Hosting a UK Know-How fund supported extensive study tour related to oil and gas industry restructuring, regulation and law for Georgia. Participants included presidential advisers, deputy ministers, and senior parliamentarians (1997). ADB project investigating new coal fired power generation technologies for application in China working with the National Power Corporation (1998). Two Tacis projects in Russia examining first the feasibility of introducing Western European technology for fuel use and heating systems in the domestic sector, followed by an implementation project (ended 1998). A UK Know How Fund project for licensing and manufacture of 300 kW hot water boilers for residential use in Georgia (1995 -1996). Support to the World Bank GEF assisting the Beijing Municipal Government in a Coal to Gas Conversion (city environment improvement) Programme (CRE Group during Dec 1999 to Jan 2000). DTI Market Assessment for Industrial-Size UK Coal-Fired Boilers and Gas Burning Technology into China (2000). The first several years of CRE Group were successful, as Group was able to follow its original plan. Income was supported by funds arising through projects carried out for the Agencies: UK Overseas Development Agency (ODA), 'UK Know-how Fund', the EC Tacis and Phare programmes, the European Bank (EBRD), the World Bank Global Environment Facility (GEF), the Asian Development Bank, (ADB) and the UK DTI. But the tide started to turn when all these revised their policies in a way not favourable to coal. Thereafter, the international coal-based consulting business went into decline. In pragmatic recognition that CRE Group could not continue in its previous form, Group retargeted its market place and subsequently, by Spring 2000, merged with another local company called Casella and became Casella CRE Energy, a trading division of Casella Group Ltd, formerly EMC Environment Engineering Ltd. The work then concentrated on emission and other pollution monitoring. One consultancy Cassella CRE carried out using CRE 'know-how' was a 2001 project, submitted in April 2002, entitled "Report on Air Quality in the County of Gloucestershire". For several years a very successful part of CRE Group was the environmental emissions monitoring team. They obtained their UKAS (United Kingdom Accreditation Service; formerly NAMAS, National Measurement Accreditation Service) accreditation and used 2 mobile laboratories (6.5tonne converted Mercedes-Benz 608D integral vans) to house an impressive array of continuous stack gas analysers. Their industrial monitoring services were sold nationwide. Particulate monitoring was done manually by means of in-duct iso-kinetic sampling probes, while specialised measuring of emissions such as dioxins and heavy metals, was carried out using equipment partly developed by the team. 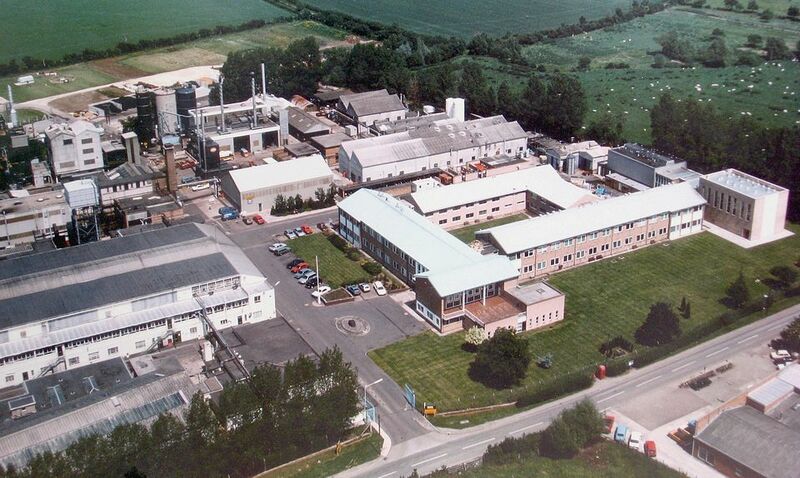 This remnant of CRE's EC Branch, which became part of Casella CRE Energy when CRE was privatised, were subsequently based at Mitcheldean, Gloucestershire, and worked within Environmental Scientifics Group Ltd (ESG), whose head office is at Bretby Business Park, Ashby Road, Burton upon Trent. But at the time of writing (August 2015), the Mitcheldean site of ESG seems no longer to be in existence. 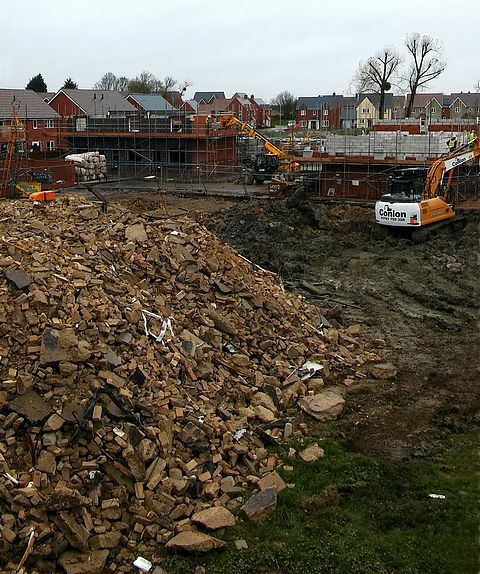 One small contingent of ex-CRE employees continued to work from the Stoke Orchard site until the end of May 2015. Gastec at CRE Ltd took over the previous domestic-heating laboratory and converted it to testing gas appliances. The Gastec group of companies provides bespoke services to clients from the gas landing point through to the burner tip and beyond, from centres in the UK, Netherlands, Bulgaria, Italy, China and Turkey. UK clients access these services from GASTEC at CRE Ltd (GaC). In addition to energy consultancy, GaC provides training and ACS (Accredited Certification Scheme) assessment for gas operatives and certification of a range of gas-fired appliances to European and other standards. From 1st June 2015, this small organisation, now named Kiwa Gastec, opened a new Training Centre, installed with a wide range of appliances, and offer Industrial Boiler Assessment (IGAS) as well as their previous domestic appliance assessment. They are still located on the Stoke Road, but a short distance closer to Bishops Cleeve (almost opposite Cheltenham North Rugby Club). Kiwa Gastec, née Gastec at CRE Ltd, is run by Mark Crowther, who was previously Head of CRE's Domestic and Commercial Development Branch (from 1989). 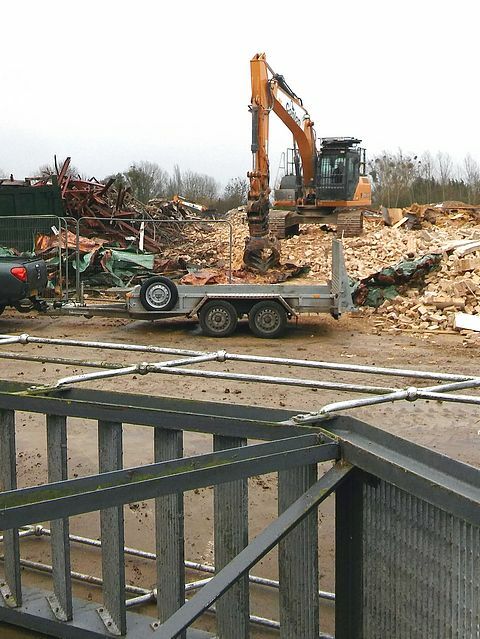 Mark finally said goodbye to the ex-CRE site on Friday 29th May 2015, see pictures below. 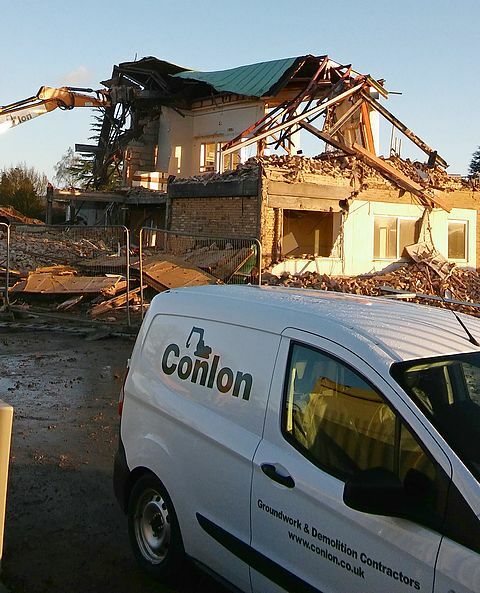 Martyn Davis subsequently organised some final equipment and materials clearance prior to turning out the lights and locking the doors for the last time, and handing over the keys to the demolition contractors, Conlon Ltd. This was maybe a week later, in early June 2015. All of the site and its buildings, apart from the 'New' office & laboratory building which was still occupied by CRE Group Ltd and Kiwa-Gastec (nee Gastec at CRE), fell into disrepair and decay after it was abandoned following CTDD closure at the end of 1997. The abandoned part of CRE site (maybe 3/4 of the total area) was demolished, cleared and re-developed for housing, starting from around mid-2011 (?). 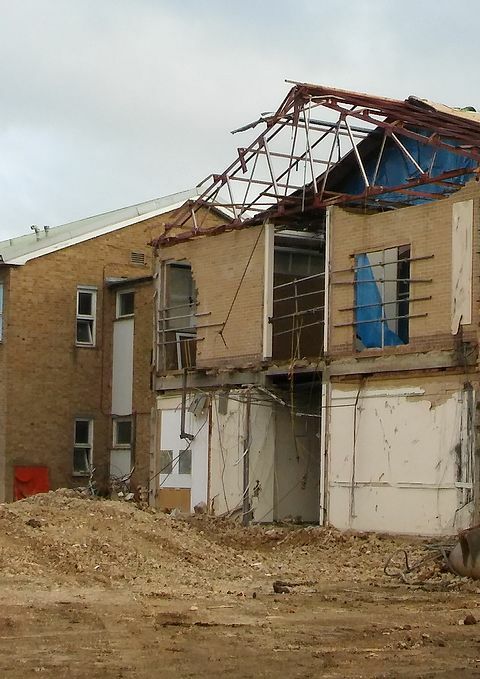 The following photographs deal only with the subsequent demolition and clearance of the relatively small area including the 'New' building, after its final tenants, Kiwa-Gastec, left at the end of May 2015 (see the Mark Crowther photographs, above). By this time, the rest of CRE site had already become a housing estate, though with some building work still in progress at the far (northern) end. From June 2015, Conlon Ltd lost no time in clearing the remaining site for re-development by Bloor Homes into 'The Orchard', a modern, high density, housing estate (see lower down this web page). 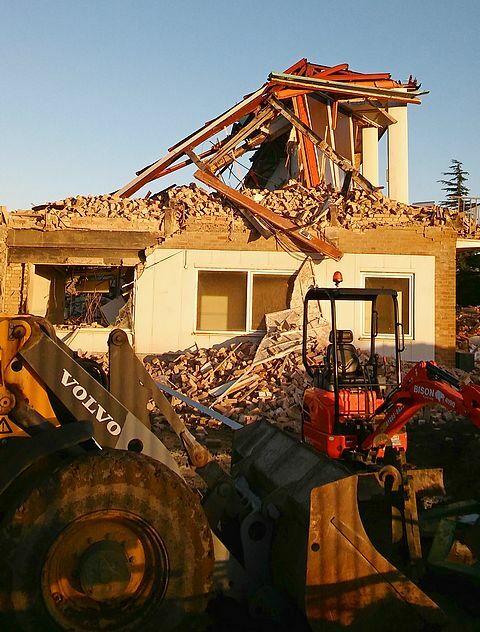 By the end of 2015, little remained apart from piles of rubble, as the following photographs show. My thanks go to John Eckersley, who has been in touch (September 2017) following Nigel Paterson letting John know about this history web page (see the early site construction photographs Nigel rescued before demolition). 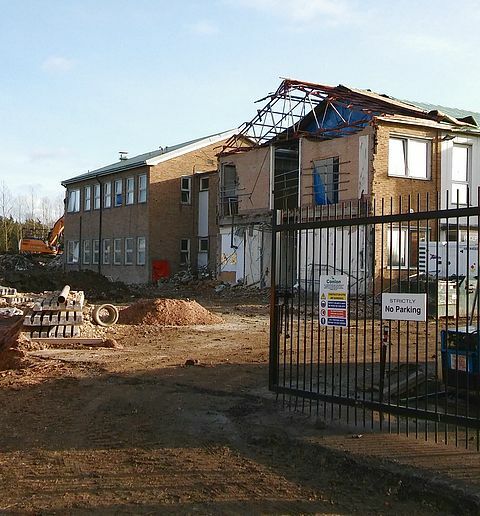 The views (including two short videos) show the final demolition of what was the earliest constructed part of the 'New' office & laboratory building, from a location along the roadway from the site entrance gates and near to where the double doors into the original 'Hanger' building would have been. Coincidentally, some of Nigel's rescued photographs show the same building being constructed, about 60 years previously, see here and here. John believes he was the last ex-CRE person (even after Martyn Davis) to enter the 'New' office & laboratory building. He gained access with one of the Conlon demolition engineers, as he wanted to acquire mementos from his old chemistry lab. 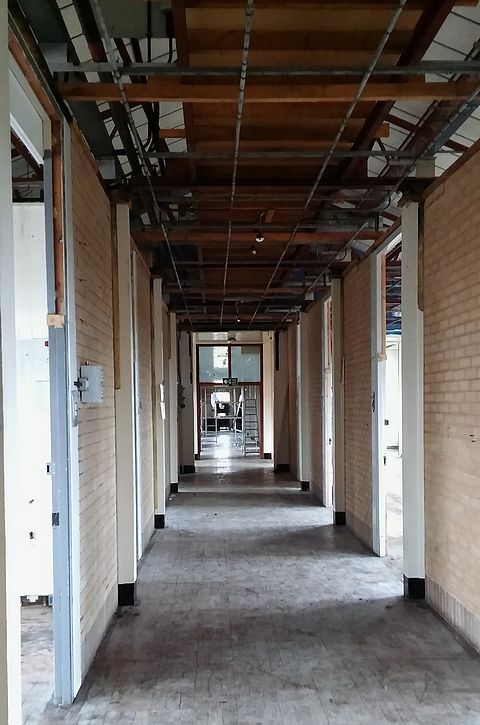 The upstairs Chemistry Laboratory corridor, a similar view to the 1973 fire damaged corridor, see above. View looking North from the opening shown right. 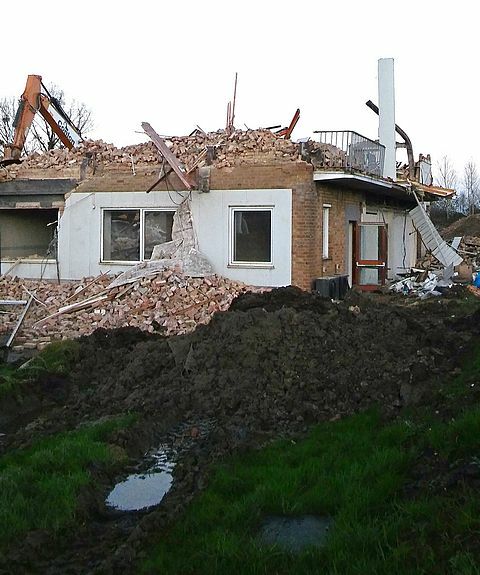 Notice that building of new houses is in progress even as the old building is being demolished. and the Eastern side building erected in the mid-1970s. The opening looks North. Notice the new houses in the distance. Looking to the main Reception entrance of the 'New' Office and Laboratory Building. The foreground is the boundary with the western part of the site, which had been occupied by CTDD until December 1997. Buildings in the western and northern parts of the site had been demolished, starting around mid-2011. Those areas of the site were already housing at the time this Dec. 2015 photograph was taken. To the extreme RHS are the original Reception entrance doors. As above and left, but with the Main Conference Room almost entirely gone. Tuesday, 22nd December 2015; 14:03hrs. Quoting Francis H. Wilson, M.I.Min.E, from his 1913 book entitled 'Coal'; "Great Britain undoubtably owes her wonderful position among the great nations of the world to her vast store of that natural source of energy - Coal. Without a cheap and plentiful supply of this natural mineral, the industries of the country could never have attained their present prosperous condition and importance..."
For almost 300 years, coal from UK mines fuelled its industrial revolution. Coal was used to power steam driven ships and railway trains, provide steam power to industry, fuel gas for lighting & heating homes and factories, provide metallurgical coke to a once vast iron & steel industry and, by the 20th century, provide electrical power to (eventually) all the population. These markets dwindled with time until, by the 1970s, electricity generation was by far the remaining largest consumer, though with a respectable tonnage still being sold into industrial, commercial and domestic markets. However, privatisation of the UK power generating industry in 1990 (née the Central Electricity Generating Board, CEGB) put in jeopardy the last major coal market and, in consequence, the entire coal industry. From 130 million tonnes of coal being mined per annum in 1980, by the end of 1994 when the British Coal Corporation was re-privatised, UK coal production had fallen to 50 million tonnes. For further comparison, consider that the UK mined 290 million tonnes per annum in 1913 and had a workforce of 1.05 million, but by 2013 UK coal production was down to a mere 13 million tonnes. In 2015 the last three large UK deep mines closed (Hatfield Colliery, Thoresby Colliery and Kellingley Colliery) and four surface mines closed (Earlseat, Laigh Glenmuir Site, Butterwell Disposal and Lodge House), such that UK production fell below 10million tonnes (Ref: Coal in 2015: a UK Gov't Special Feature article by Chris Michaels, Coal Statistics). The Institution of Chemical Engineers magazine for October 2017 contained a brief note entitled "Coal slump continues" with the news that, in July 2017, just 2% of the UK's electrical power came from coal, the lowest level in the 135 years since the UK's first coal fired power plant started up in 1882. That was a fall from 4% in July 2016 and 22% in July 2015. The National Grid reported that the 21st April 2017 was the first day that the UK had produced no electricity at all from coal. So the end of the 20th century quickly became the end of the age of coal, at least in the UK. Whether this was for political, economic or environmental reasons, is open to debate - no doubt a combination of all three. Coal is certainly the highest CO2 emitter of the fossil fuels, per unit of useful energy, but environmentalists sometimes give the impression that only coal is responsible for global warming, while no fossil fuel is exempt. And transporting supposedly CO2 neutral biomass fuels long distances, but using fossil fuel as the motive energy, seems an odd alternative. When I joined the coal industry, in 1978, one of the earliest statistics I learned was that, at the (then) current rate of usage (let's say 120 million tonnes per annum), the UK still had 300 years of this indigenous fuel reserve. But once a mine is closed, it cannot simply be re-opened, as the maintenance needed in order to keep a mine safe must be carried out as an ongoing activity. The coal is still there, but accessing it again would require substantial investment. That the UK's coal was mostly accessible only by costly deep-mining technology, was the Achilles' Heel of the industry. Several countries, with large areas of unpopulated land, operate huge open-cast coal mines, where coal can be extracted at significantly lower cost than from UK deep mines. Even with long haul transportation, imported open-cast coal is often the cheaper option. There are also factors such as low sulphur content (avoiding costly emissions abatement equipment) and low chlorine content (an indicator of a coal's tendency to foul heat transfer surfaces) which can also favour imported coals. While it is comforting to know that one's country has 300 years of indigenous coal reserve, we live and work within an ever more competitive global economy. Speculating about long term problems that may emerge from relying upon imported fuels, while ignoring its immediate economic advantages, leaves one's manufacturing base vulnerable to overseas competition. This is especially true in a developed country where labour costs are high, since labour is a greater component when burning coal than with other fossil fuels. And the environmental argument against coal, while perhaps over-stated, needs to be addressed, especially in the context of meeting EU, International and moral obligations. The scientists and engineers who worked at CRE have left a legacy of well researched information that may find application in the future; if not directly to coal, it may have a relevance to other technologies yet to emerge. Whatever its future usefulness, the information from CRE, and also from BCURA, Grimethorpe and Point of Ayr, has been preserved and is stored in the library of North of England Institute of Mining and Mechanical Engineers (NEIMME), Neville Hall, Westgate Road, Newcastle upon Tyne, Tyne and Wear, NE1 1SE (in May 2006 contact details were: tel. 0191 2332459; e-mail: librarian@mininginstitute.org.uk). As it says on its Home web page (http://www.mininginstitute.org.uk) "We don't deep mine for coal anymore but the NE still leads the world in keeping the industry safe". Steve Wright, in his polemical book on the Grimethorpe PFBC development, says that "Apparently, the NCB (as it was at nationalisation) was the only nationalised industry named in the Public Records Act. Every scrap of paper had theoretically to be offered to the National Archives of the Public Records Office (PRO) based in Kew, before further disposal. Once CRE Group became a wholly owned subsidiary it was no longer covered by the Public Records Act. However, all its reports and files prior to CRE's privatisation were required. It was finally established that the PRO only really wanted copies of reports and some 'important' files". These latter were provided to Kew and copies made so that "In fact all the files went into the British Coal archive (NEIMME) for storage on behalf of the PRO". One important (to this author) set of documents that, to the best of his knowledge, were destined not to end up at the NEIMME, was the Combustion Systems Ltd (CSL) Fluidised Bed Combustion (FBC) Design Manual. This multi-component, loose leaf (for amendment purposes) Design Manual became part of the Intellectual Property contained within the sale of CRE Group Ltd to IMC Group Holdings Ltd; presumably because it was seen to be of commercial value, since its contents had been licensed (for a fee) to a number of organisations worldwide, especially throughout the 1980s. In 2005, the author approached the small remnant BCURA coal research funding organisation based in Cheltenham, for their advice on whether this Manual might be rescued and put into the public domain. It encompassed most of the information on shallow bed FBC from the work of CRE's ID & AD Branches between 1974 and 1994, plus earlier deep bed FBC, including oil burning, carried out at the Leatherhead Laboratories of BCURA from the autumn of 1963. Steve Wright, who was 'in' on the very beginnings of UK FBC R&D, recollects this clearly in the opening chapter of his book. Casella CRE Energy (who owned CRE Group by 2005) were approached on whether they had any objections to the CSL Manual being retrieved back into public ownership and they kindly agreed, since they had no foreseeable use for its technology. Thence, by private funding made available by Dr William (Bill) Kaye, previously a Deputy Director of CRE in charge of AD & ID Branches (plus the Domestic Heating Laboratory), scattered remains of the Manual were pieced together and, by 2008, made available as a searchable CD containing a series of PDF files. "The British Coal Utilisation Research Association (BCURA) wishes to acknowledge and thank Casella CRE Energy Ltd (a part of Casella Group Ltd) for giving their permission for BCURA to transfer the CSL Fluidised Combustion Process Design Manual into the public domain by submitting this Manual to the BCC/BCURA Library in Newcastle-upon-Tyne and by submitting copies of this document to other suitable publicly accessible locations to include the libraries of selected UK Universities. BCURA Registered Offices, The BCURA Company Secretary, c/o Gardner Brown Ltd, Calderwood House, 7, Montpellier Parade, Cheltenham, Glos. GL50 1UA". The CSL Manual is publically available on-line at the University of Bradford library. On 12th June 2017 I attended the funeral of Lyn(don) Stephens, at St Michael and All Angels church at Bishops Cleeve. Lyn Stephens had an impressively varied working and social life. 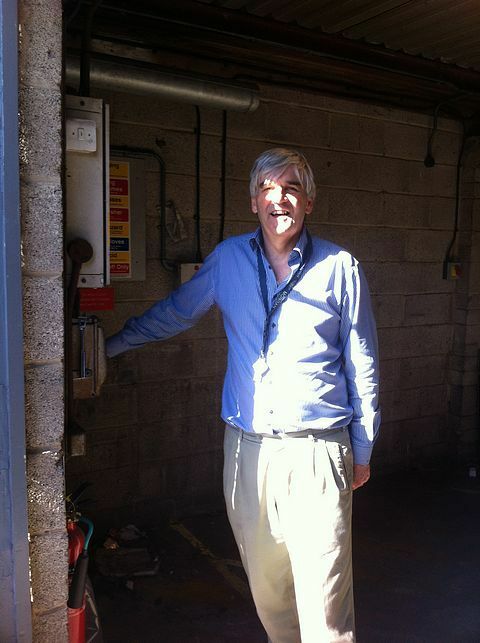 The author spent time working with Lyn at a 10MW (thermal) demonstration fluidised bed boiler located at Rists Wires and Cables, Newcastle-under-Lyme. Nothing was ever too much trouble for Lyn. He was always in good humour, which made working with him a pleasure, a sentiment I know will be echoed by all my colleaguies who came into contact with him. The photograph alongside was taken on 20th November 1985, when Lyn was aged 58. 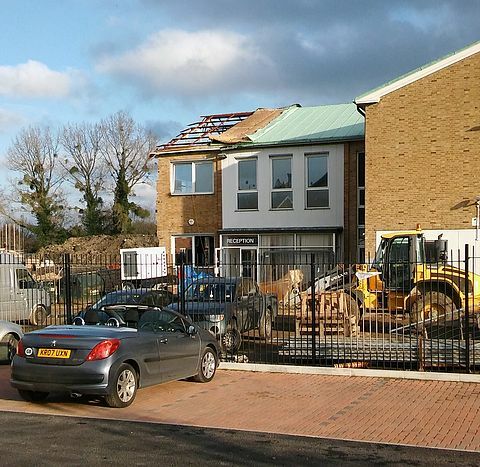 I had to drive past the old CRE site on my way to Bishops Cleeve, so I stopped for a short time and took a few photographs to record what has happened to the site since Martyn Davis turned out the lights and locked the main entrance foyer doors in early June 2015. It had been totally re-developed by Bloor Homes into a large housing estate, such that, even for someone who worked at CRE for near 20 years, I found it difficult to imagine it was the same plot of land. Bloor Homes sign boards along the Stoke Road adjacent the site and viewing away from Bishops Cleeve. Looking from the Stoke Road to what was CRE site's main entrance. Now called Armstrong Road. Viewing from where were previously the site's gates and gatehouse. Immediately to the right of the entrance road is now the Stoke Orchard Community Centre. Looking along the roadway that bisected CRE site. Looking back towards where the site entrance gates used to be located. The Main Hanger building would have previously been on the right hand side of this picture.